The EON 15-X offers great configuration options and a powerful desktop CPU, but its mobile GPU holds it back from true desktop-caliber gaming performance. It’d be difficult for a laptop to match the performance of a desktop gaming rig. After all, mobile form factors are limited by size, cooling capacity, and their batteries. But Origin PC’s EON15-X, unlike the majority of gaming notebooks, is based on Z97 Express—an actual desktop platform. It’s designed to house some of the same high-end hardware found in more stationary systems. As an added bonus, the EON15-X is oh-so-configurable. It takes everything from a relatively tame Core i5-4460S to the flagship Core i7-4790K. Drop a mainstream GeForce GTX 965M into its MXM interface, or splurge on Nvidia’s GTX 980M with 8GB of GDDR5. Four memory slots accommodate anywhere from 8 to 32GB of DDR3-1600 memory. And the storage options are seemingly endless. Between two 2.5” bays and a pair of M.2 slots, you can install 3TB worth of SSDs. 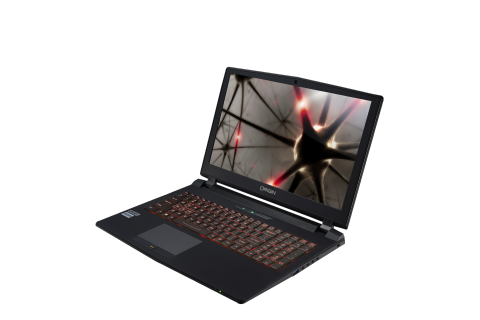 Now, a fully decked-out EON15-X is prohibitively expensive at over $5000. Origin PC’s baseline configuration is much more reasonable, starting around $1700, and the configuration we’re testing costs about $1000 more than that. But isn’t customization one of the reasons we love PCs? You might not be the one putting the pieces together when buying a laptop, but you get to decide what’s important and have a company like Origin PC handle integration. Origin’s build team starts with a Clevo P750ZM chassis. From there, our review sample includes a Core i7-4790K—the same CPU found in many of the fastest gaming desktops. That processor is complemented by a pair of 4GB DDR3-1600 memory modules from Corsair, leaving room for two more at some point in the future. Because it’s not possible to shoehorn in the 165W GeForce GTX 980, Origin PC instead uses the mobile 980M, which loses quite a bit of performance compared to the desktop version but has no problem providing smooth framerates at the notebook’s native 1920x1080 resolution. Speaking of displays, the EON15X's screen is perhaps its greatest weakness. TN technology affects viewing angles on the vertical axis quite a bit, and a matte layer over the top washes color out more than we were expecting. Origin PC will calibrate the display for an extra $29, but that’s not enough to rectify the panel’s inherent shortcomings. Storage, on the other hand, is a high point. Our EON15-X strikes a perfect balance with Samsung’s 256GB XP941 PCIe-based SSD and a 1TB disk offering plenty of room for user data. There’s space inside for one more M.2 drive and another 2.5” repository, too. The most graphically demanding tests remain limited by Nvidia’s mobile GPU. As if the desktop-derived platform wasn’t already potent enough, for $75 Origin PC will overclock your build as far as it’ll go stably. Ours arrived with its four Haswell-based cores set to 4.5 GHz, theoretically giving the EON15-X a sizeable performance advantage. Unfortunately, a commanding lead never materialized in our gaming-oriented benchmark suite. The most graphically demanding tests remain limited by Nvidia’s cut-back GM204 processor. GRID 2, where we’d expect the faster CPU to really show off, runs no faster on the EON15-X than competing laptops with mobile chips. In fact, the Asus RoG G751JY-DH71 that we chose as our favorite gaming system is faster for less money. The issue, of course, is that an overclocked desktop processor is best suited to video editing, image manipulation, transcoding, and software development—threaded workloads able to tax multiple cores simultaneously. Games want more graphics horsepower, and on that front, most high-end notebooks are on even footing with Nvidia’s GeForce GTX 980M. It takes a dual-GPU beast like MSI’s GT80 Titan SLI-001 to go above and beyond. Although Origin PC is somewhat limited in how it improves the speed of Clevo’s P750ZM, the company certainly knows how to better the platform’s looks. In its stock trim, the laptop is all-black with soft-touch material covering most surfaces. You can certainly buy it that way. But why would you when Origin PC lets you choose between a white- or red-painted lid at no extra charge? The glossy finish is attractive, and also serves to mask fingerprints really well. Should you wish to dig deeper into your wallet, pricier paint jobs are available. Given its substantial specifications, you probably won’t be surprised that the EON15-X is neither thin nor light. It measures 15.2” wide, 10.31” deep, and is 1.4” thick. Weighing in at 7lb 10oz, even some 17” notebooks are less massive. But what you give up in portability is more than made up for in connectivity befitting a desktop replacement. Four USB 3.0 ports accommodate plenty of peripherals. Dual DisplayPort outputs and HDMI facilitate multi-monitor configurations. Gigabit Ethernet complements the built-in wireless 802.11a/b/g/n adapter, and a combination eSATA/USB port enables even more storage scalability. Despite the overclocked desktop processor and high-end graphics module, you can expect just over an hour of battery life in 3D workloads, similar to competing laptops with less powerful mobile CPUs. We did notice, however, that if you disconnect the AC adapter while a game is running, the GPU’s clock rate won’t drop, even though Nvidia’s Battery Boost technology caps the frame rate at 30. Other notebooks throttle the GTX 980M’s core back under 700 MHz in our looping Unigine Valley test. Achieving our battery life result requires unplugging the EON15-X before starting a game. That’s a minor quibble. We suspect most enthusiasts will wait until they’re near a wall socket before firing up their favorite game. In that environment, the EON15-X excels by virtue of its desktop-derived platform. Just don’t be surprised when you connect up to an external QHD or 4K monitor and find performance bottlenecked by the GeForce GTX 980M. For its premium price, Origin PC’s desktop replacement shines brightest in the apps that lean on its big CPU and not graphics.